Independent developer Syvaron is creating a gameplay-driven, tactical management, RPG sim about monster girls and a quarrel between gods. As you stand upon the countryside of your inherited farm with your girlfriend at your side the sky above you tears and portals form. You're both chosen by a pair of gods to become their avatar. One sees hope in the future of the living beings, values the already existing life, and wants to see it evolve. The other is a disappointed deity that wants to erase whatever life exists to create new beings equally deserving of living but with the potential to be much less flawed than the current design. As the player, you're allowed to choose which god inhabits your body. Portals of Phereon is an independent project developed by Syvaron with the aid of Patreon funding. It is designed with gameplay as its highest priority. The game is planned to be highly replayable, with a lot of randomly generated features, and a lack of a linear story. Instead, it will feature a basic set of goals, for one god to win the other to their side, with plenty of different ways for the player to get there. Currently, the game boasts impactful RPG mechanics. The choices made during character creation highly determine the gameplay style for the rest of the experience. 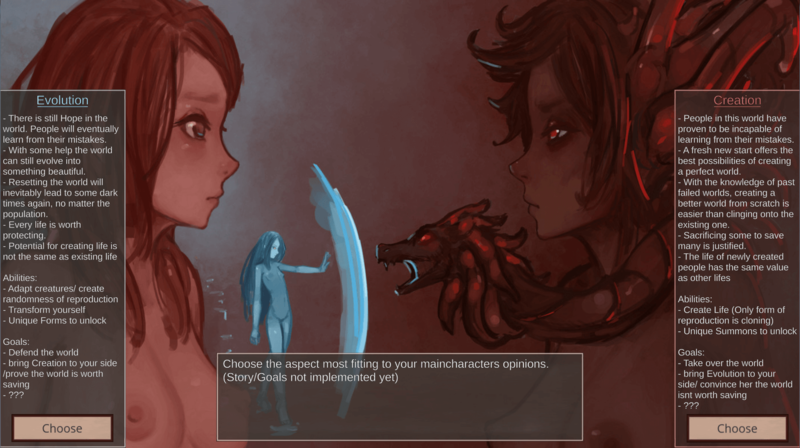 Players may desire to manage and grow a herd of various humanoid monsters of three genders (including futa) or to explore the randomly-generated worlds beyond the portals instead. Even then, there’s combat, random events, gathering, and other activities available, as Portals of Phereon aims for a great array of tools at the player’s disposal. The most interesting feature in the project so far is the difference between the two available gods. Followers of evolution will be able to breed tamed monster girls and boys to unlock various new cross-species by breeding them between each other. As these are discovered, the player themselves becomes capable of transforming into different species to better suit their adventures. By playing as a god of creation, the player cannot have their followers breed, and has to clone them instead. As a creation player grows in power, they unlock powerful abilities to summon new, unnatural species into existence. The game’s management functions allow for breeding, brothel work, quests through specimen delivery of specific and trained characters, and arena combat. The exploration portions allow the player to enter randomly generated world behind portals. 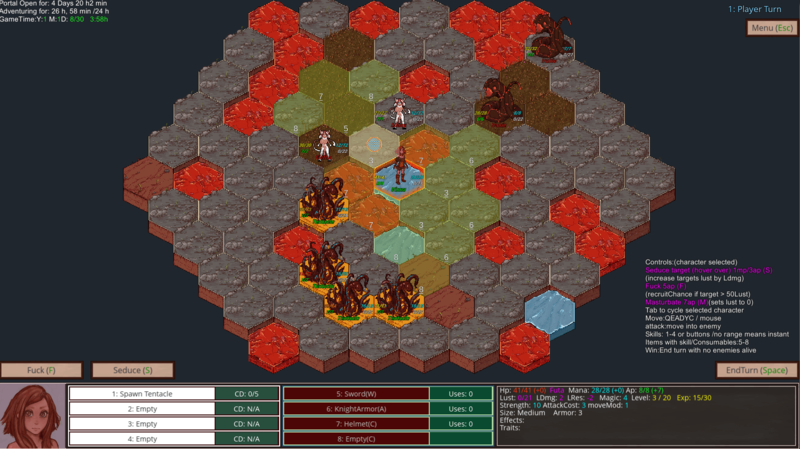 They then move on a square grid, approaching either event markers for a VN-like story segment or combat markers for turn-based battles that take place on a hex grid. Players can also gather resources like wood for farm upgrades or to build helpful segments like roads. Syvaron presents himself as a hobbyist artist and programmer, with the project being his aim at uniting his passions into a singular activity. He plans to make a game that he’d like to play himself. Portals of Phereon is free. You can try the latest build yourself by downloading it from here. You can read more about the game directly from Syvaron’s Patreon page. Any donations to the project will let you access the voting polls, with further tiers offering no additional bonuses. Keep an eye out on upcoming lewd games by following us on Twitter and Tumblr. If you’d like to support LewdGamer directly, consider donating to our Patreon.